Enjoy the warm weather and comfortable atmosphere of California's Inland Empire with the timeshare units at Marriott's Desert Springs Villas. Find timeshare resales and rentals priced up to 70% below retail values with SellMyTimeshareNow.com. The beauty and majesty of Palm Desert is on display at Marriott's Desert Springs Villas I. As the first phase of a larger resort—along with Marriott's Desert Springs Villas II—the Marriott Desert Springs Villas feature a wide range of luxurious on-site amenities and exclusive services to make your stay more enjoyable. Seven swimming pools, an on-site golf course, coordinated children's activities, and more serve to ensure your vacation is one you'll never forget. The villas at the resort range from efficient, yet well-appointed studios to sprawling two bedroom units perfect for families or groups. Guests from all walks of life will undoubtedly enjoy the upscale furnishings like the fireplaces, private balconies, and full kitchens. Ideal for golfers, hikers, foodies, and anyone looking for some rest and relaxation, the villas at Marriott's Desert Springs will ensure your stay is comfortable. If you're ready to secure accommodations at this luxury resort every year, the timeshare resale and rental advertisements currently available provide the perfect solution. Fill out the form on this page to learn more about ownership options, or call a representative directly at 1-877-815-4227. Purchasing a timeshare resale at one of these Marriott Palm Desert villas can unlock years of great trips to California at a fraction of the price. Timeshare resale advertisements are posted for-sale-by-owner, which means they're often priced more affordably than what the resort itself offers. 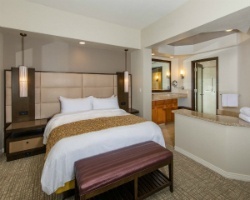 You could find amazing timeshare accommodations at the Desert Springs Villas for up to 70% less than retail value. What's more, you can still plan future vacations according to your own preferences. 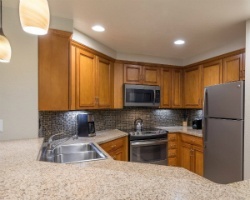 Marriott Desert Springs Villas timeshare resales come in the form of deeded fixed and floating Marriott timeshare weeks, giving you flexibility in finding an ownership interval that works for you. Timeshares at the resort fall within Marriott's Blue, White, and Red seasons, which also gives you a wide variety of price points to consider when buying a resale. Even better, your timeshare resale at the Desert Springs Villas could give you easier access to the Marriott Vacation Club. The Desert Springs Villas are affiliated with Marriott Vacation Club. While resale buyers can start making reservations at the resort as soon as the transfer of ownership is complete, you may choose to take advantage of the Marriott Vacation Club Destinations program to elevate your ownership and unlock more perks. If you decide to upgrade, you could use Marriott points instead of weeks to reserve accommodations at the Villas, or at other Marriott resorts around the world. Marriott's Desert Springs Villas are affiliated with Interval International, one of the world's leading timeshare exchange companies. Obtaining a separate membership with Interval can help you to truly get the most out of your timeshare resale ownership. Simply deposit your Palm Desert accommodations into the exchange network and trade for stays at similar resorts around the globe. 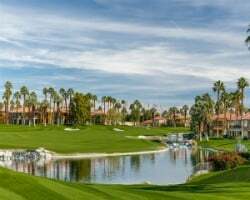 Additionally, the Marriott Desert Springs Villas currently maintain an Elite Resort rating from Interval, meaning their superior amenities and services will earn you more trading power when you want to exchange. There's no shortage of amazing on-site amenities and services to discover at this Palm Desert Marriott timeshare resort. For starters, the resort's six swimming pools—complete with whirlpool spas—will ensure complete and total relaxation. Golfers will love the immediate access to the Desert Springs Golf Club for endless days of hitting the links with the beautiful desert backdrop as your surroundings. Resort features like free on-site parking, free WiFi, babysitting services, and delicious cuisine at The Water's Edge Pool Bar & Grill offer the ultimate convenience so you can truly enjoy your trip. Nearby, the Palm Desert and Palm Springs area is host to a world of adventure and discovery. Visit the Living Desert Zoo and Gardens or the Palm Springs Art Museum for easy day trips, or catch a live show at Civic Center Park. Head up to Palm Springs to embark on the Palm Springs Aerial Tramway, which offers unparalleled vistas of Mt. San Jacinto. 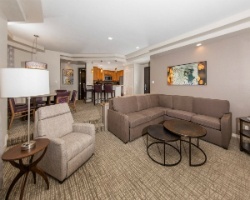 Already Own at Marriott’s Desert Springs Villas?